We have just released a new interim patch release v1-0-0-3 that should cover you for the next week while we finish up the new work to do with custom user libraries and Projects being updated. More of that in the next week or so. We have seen a few reports since skyline was released to the public last weekend. 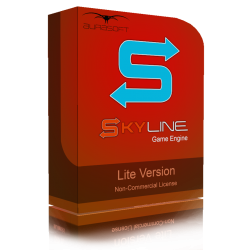 With that though, we have had many returning users who were in the beta program and some new Lite version downloads also, so skyline is on the rise once more. This release focuses on some of the issues that have been brought to the surface. We have released an auto update and Full install for you to get going from. 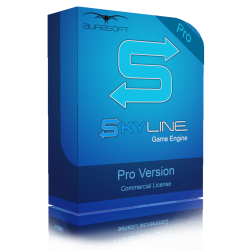 Auto update is recommended - If you don't have Skyline - Pro or Skyline - Studio Pro, then you cannot auto update. Note: If you are reinstalling, then please make a backup of your asset library files that you have added, as they will be removed on uninstall if they exist inside the Install Directory!. Fixed: DX11: Shader error in vertex shader when the shader required vertex colours to used. Fixed: Mapping on Tree view for explorer view was wrong and returning a blank path to add to resources and other tools. Fixed: Camera that was added to scene and set to orbit would crash on stop. Fixed: xPreset XML files were not loading because since going v1.0, it would not load certain sections. Fixed: Lights that were spawned as point lights would be slow due to the light having cast shadows enabled. Fixed: Editor Mesh: Did not resize correctly and left a tiny viewport in the bottom left..
More to come in the following week. Thanks and enjoy your development. Believe them when they say, BACK UP YOUR WORK - your scene files and folders. I made the mistake of re-installing Skyline on the update and it deleted EVERYTHING I was working on because I unwittingly had the scene files and folders inside the Skyline Asset folder. I lost hundreds of hours of work. Good news is, I was able to much more quickly create it with Skyline's excellent tools and support. Now all of my work is on separate hard drives and with multiple backups. Valuable lesson learned!